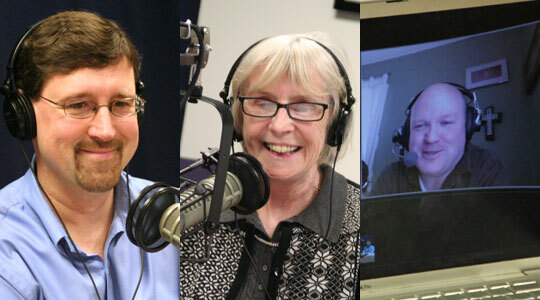 Summary of today’s show: Scot Landry and Susan Abbott sit with Greg Tracy during Thursday’s news roundup while Fr. Roger Landry flies to the Holy Land. The beginning of Lent is the big story of the week, including free fasting bread from a local baker, as well as the consistory that created 22 new cardinals, including two from the US; Msgr. James Moroney’s new column on the Mass prayers for Lent; a behind-the-scenes look at how The Anchor comes together each week; and more local news. 1st segment: Scot welcomed Susan to the show on the second day of Lent. Scot said Susan is preparing for the Catechetical Congress on March 24 at Boston College High School. They have a couple dozen workshops planned in English plus more in Spanish and Portuguese. There will be hundreds of attendees. Scot said today is Fr. Roger Landry’s birthday and thus Susan said it is also Scot’s birthday. Scot said Fr. Roger is leading a pilgrimage to the Holy Land and Scot’s wife and son are on the trip along with Scot and Fr. Roger’s parents. They left for the Holy Land today. Scot said Fr. Edward O’Flaherty, the director of the office for ecumenical affairs, died this week. He and Susan worked very closely over the past 10 years. Scot said he’d been sick for several months. 2nd segment: Scot and Susan welcome Greg to the show today. Scot said the big news this week is the beginning of Lent. They discussed their Lenten resolutions. Greg said he is giving up fresh-baked bread for Lent. In his house, they have fresh bread four or five days a week in his house. Susan said she gave up Diet Coke for Lent last year and never went back to it. She went from 32 ounces per day to one or two cans per week. Scot said the Pilot has a front-page story on Andy LaVallee of LaVallee’s Bakery Distributors, who we had on The Good Catholic Life, going more in-depth on the fasting breads that his company is providing free of charge this Lent. These are breads that are all-natural and more nutritious so that people don’t become more hungry while fasting. Most breads make you more hungry, making fasting more difficult, whereas these breads satisfy. It’s a great story of a Catholic businessman seeing some aspect of the faith and taking it to the next level, using his business to help people live their faith. Scot then discussed Pope Benedict’s remarks on Ash Wednesday about Lent being tied to Jesus’ 40 days in the desert and Israel’s 40 years in the desert. Susan recalled the Gospel passage in which the angels ministered to Jesus at the end of the temptations in the desert and the Holy Father says the angels are there to minister to us as well. New in the Pilot is a column by Msgr. James Moroney, who will be rector of St. John Seminary in July, in which he writes about the new prayers of the Liturgy. This week is the opening prayer for the First Sunday of Lent. Greg said Msgr. Thomas McDonald used to do a similar column some years ago, until he passed away. They hope to do this during Lent and Advent. Scot said he’s heard priests say that they are glad that the new prayers bring back the treasures of the Liturgy that we haven’t had for so long. of the riches hidden in Christ: Christ who graciously showers me with mercy and peace and love. The observances of holy Lent are outward signs. When I go to the Stations of the Cross on Friday night, or to confession on Saturday afternoon, when I pray an extra fifteen minutes at the end of each day, I grow in understanding of the riches hidden in Christ: Christ who fills my heart with his hope and strength and a clear vision of his love for me. 3rd segment: Scot said last Saturday Pope Benedict XVI made 22 new cardinals, including two from the United States and one from Canada. They discussed why the Catholic News Service lumps together Canadian and American news, i.e. “The Pope created three cardinals from the US and Canada.” Greg said Catholic News Service is also used in many Canadian Catholic newspapers so they have tried to broaden their coverage. Scot said much of the coverage focused on Cardinal Timothy Dolan of New York. In a great honor for Cardinal Dolan, he was asked to give a keynote address to all of the cardinals of the world the day before the consistory. A lot of the secular press asked whether that made Cardinal Dolan high on the list as papabile. He told a reporter that what he really aspires to is becoming a saint. Susan noted that both Cardinal Dolan and Cardinal Edwin O’Brien, grandmaster of the Equestrian Order of the Holy Sepulcher of Jerusalem and former archbishop of Baltimore, stressed in their remarks that this is not a personal honor, but a call to greater service to the Church. Scot said the Holy Father told the cardinals that they also have to be prepared for martyrdom, giving their lives for the faith. 4th segment: Scot said the Anchor this week celebrates Catholic Press Month by providing a front-page story about how the newspaper is produced behind the scenes. It shows how much work goes into making a 24-page paper every week. Susan said when she was in college she worked as a copy editor at the Boston Globe on weekends and find it hasn’t changed much since then. Greg found it enlightening to see how others do the same work and to see how similar their work is. Scot said the Anchor goes to press on Tuesday afternoon and they get started on the next week’s paper the next day. Greg said the Pilot goes to press on Wednesday between 5 and 6pm and drops in the mail by 10 or 11am on Thursday so it arrives in parishes on Saturday. He said Wednesdays are difficult days. Putting the paper together is like fitting pieces of a puzzle and by Wednesday you have to start fitting things in every little space. Scot said about 1/3 of the paper is local news, 1/3 is advertising, and about 1/3 comes from Catholic news services. Greg added that the number of pages of the newspaper comes from the amount of advertising, which leaves you the “news hole” to fill. He said local content comes from news stories and opinion pieces and columns. They are often asked to give more local content, but they also have a mission to help the people in the archdiocese get exposed to Catholic news beyond the borders of the Archdiocese. A recent study shows that the only Catholic publication that most Catholics see is their diocesan newspaper. The panel discussed the life and death and service of Fr. William Burckhart. Greg noted an anecdote that Fr. Burckhart and his sister were the impetus behind the change in Massachusetts from handicapped license plates to handicapped placards, which allows the person to park in a handicapped space whatever car they are in. Scot mentioned the announcement of new appointments of two pastors. Fr. Edward Doughty will become Pastor of St. Francis of Assisi Parish in Medford, effective March 1, and Fr. Mark Ballard will become Pastor of St. Mary of the Annunciation Parish in Melrose. Also in the Anchor this week is a profile of the “Catholicism” TV and DVD series by Fr. Robert Barron, which Scot called the greatest long form presentation of the faith in broadcast media.